The second V8742 is almost complete. Here are some photos of the work in progress. The first shows the gathers on the side front piece that was stitched. This is a beefy slinky knit fabric and the gathers created were easier to do than on my first dress. This is a view of the front of the dress, sleeves are sewn but not attached at this time. This is close up view of the front gathers. And a view of the back. 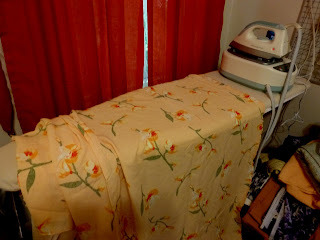 I have not attached the bias binding yet, so the back opening did not stay closed while taking the picture. Not much left to do: attach neck binding, insert sleeves and hem. Thanks to many of you who left comments regarding my last post. I am now onto my next project. 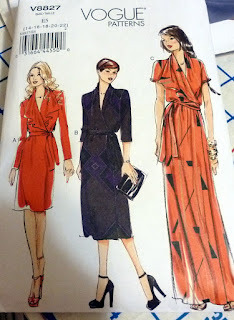 I am making my second version of a successful Vogue pattern, one that is OOP-Vogue 8742. I am hoping that this one comes out as well as the previous one. I am using a somewhat different knit and one that has been in my stash for six years. I acquired it on an ASG bus trip to Mary Jo's in Charlotte, NC. I cut it out last night and plan to sew it up today. Updates later. I hope everyone is enjoying the holiday weekend. I am calling Uncle on Vogue 8827! It is just not working for me. 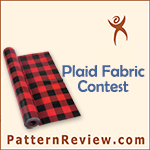 The more I work with this pattern it is very clear that it is not drafted well at all. The draping of the collar is not working well and I think it has something to do with the facing piece not drafted correctly as this is the side one will see when wearing it. Also having to attach ribbon inside for tying to keep dress closed is not pleasing. Others used button and loop or redrafted to use the ties to go through side seams and tie like with a real wrap dress. The more I worked with this the more I disliked what I was doing. I came to the realization that I would probably only wear the dress once or not at all after completing. I can be somewhat OCD when it comes to sewing projects. Calling uncle and putting it all aside was such a relief. I have more fabric and better dress patterns to sew. Plus some skirts and tops are calling my name. I am so looking forward to this holiday weekend. I am really hoping to get more sewing in than I have over the past two weekends. I am still working on Vogue 8827 and it is a pain! I read through reviews on PR of this dress and I now know what everyone has experienced with this dress. For a neat looking dress, IMHO, it is so very hard to follow the instructions in some areas. Off to sewing room now to give some time to this dress! I had to travel for business the latter part of this week, so progress on the Vogue dress came to standstill. I just got back home about two hours ago. I did attach the yoke and yoke lining earlier this week. I used a technique from this book "Sewing Secrets from the Fashion Industry". I have had this book for many years. 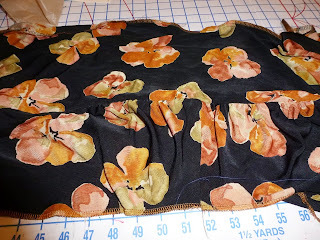 I wanted to sew the yoke and yoke lining without doing any hand stitching and though I have done this numerous times, I just was not remembering the exact sequence. This book spelled it out very nicely. I took a photo of the completed yoke using my phone and need to transfer this over to computer. I am taking a day off tomorrow to do several household chores I normally do on the weekend. I hope I may find a few moments to spend sewing some more on this dress. I made a lot of progress on my new dress project, V8027. I cut it all cut out. Interestingly there are no interfaced pieces, basically cut and sew. I did have one hiccup. Because I cut the front facing with draping collar reversed, I had to reverse all the front pieces. I am so happy that I caught that when I did or I would have ruined good fabric. I ran into an issue with the collar area and had to go back and redo that area. I ran out of time at that point as DH and I had dinner plans for Mother's Day. Here are two photos of the work in progress. The lighting/flash on camera washes out the pretty color of this fabric. My DH was home this AM when I was getting ready for work. I was thrilled when he saw my new dress and he was very complimentary. He actually said "Alma would be so proud of you and this dress". Alma was my grandmother from whom I got the sewing gene. He took photos of the dress using his phone-so as promised before here are two shots of the front of the dress, wish I had gotten him to take a picture of the back as this was a great fit for me. I know you can not see the ruching (gathers) in these photos. I got lots of compliments at work today and what was noticed was the ruching. I already have another knit fabric washed and ready to make a second version of this dress. I forgot to post a photo of my fabric for the wrap dress. I purchased this sometime in 2009 or 2010. I think it may wrinkle some, but hoping not too much. It seems to be the right weight for a draped collar and for dress that wraps. Here is a photo of the navy blue lace fabric I purchased from Mood. This is the perfect navy color I have seen in a long time. I just had to have this fabric after seeing it here on Goodbye Valentino blog. She also made skirt for her daughter from this lovely fabric. 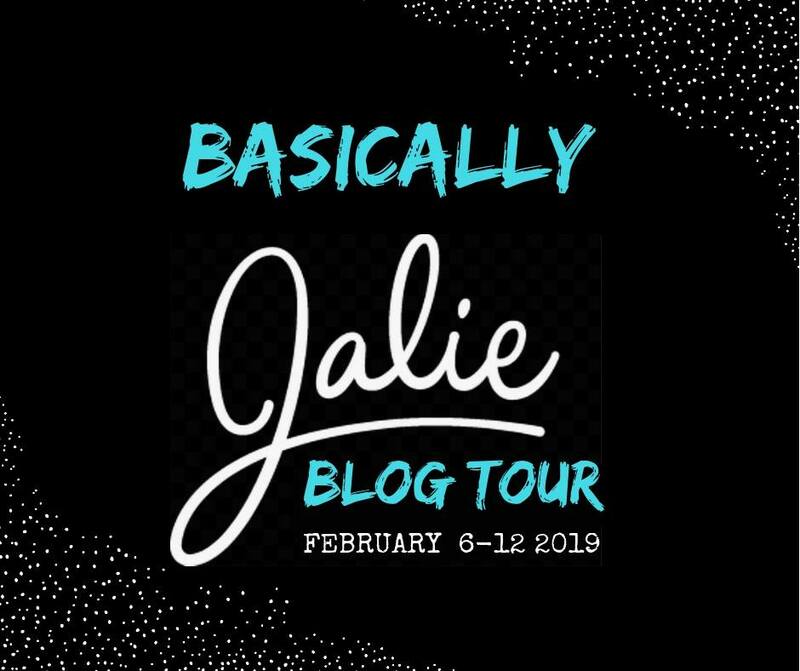 I was surprised to see that I had not posted anything since last week; bad blogger! I have been sewing sporadically this past week. Inserting a sleeve one day, inserting the other one another day. Setting up cover stitch machine to hem sleeves and dress, completed that task yesterday and V8742 is now complete. I plan to wear it next week and will take photos. I will be making another dress from this pattern. I love the fit of this one and with all the tweaks with this one the second one should about sew itself! This AM I started fabric and pattern prep for my next Vogue dress. I have not made a wrap style dress in years. 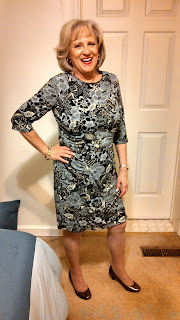 I know that there was a lot of wrap style dresses made from a few favored patterns. 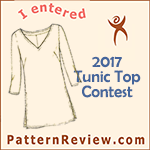 I like this pattern because of the draped collar and particularly the asymmetrical version; though I have not intentions of making that long version.